Jean-Baptiste Alphonse Baudin was a French medical doctor, a politician and a member of the National Assembly from 1849. 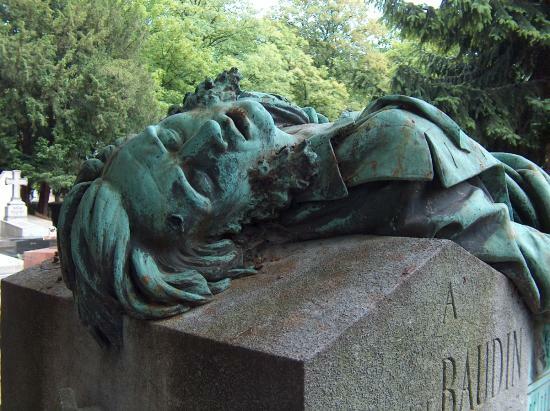 While opposing the coup of Louis Bonaparte in Paris, Baudin attempted to motivate the workers to join the barricade by climbing atop it and was shot and killed in 1851. He was hailed as a martyr to the Republican cause. Montmartre cemetery in Paris was the original burial site; his remains were later transferred to the Pantheon of Paris on 4 August 1889. The sculpture created by Aimé Millet in 1872 shows the bullet wound above his right eye. An olive branch symbolizing peace rests between the tomb and a tablet on which his hand rests. The tablet is marked La Loi translated as The Law. A headstone attached to the tomb is inscribed; In memory of Alphonse Baudin representative of the people who died defending the law on December 3, 1851. Erected by his fellow citizens 1872. At the head of the tomb is a Masonic hexagram supporting a wreath. The sculptured figure is so realistic that I find something newly interesting in each of these images. Light leaving the body and death taking over are suggested by shadows in the image below. It also speaks volumes through body language with head drooped to the side, feet apart, fingers resting on the ideals he fought for.